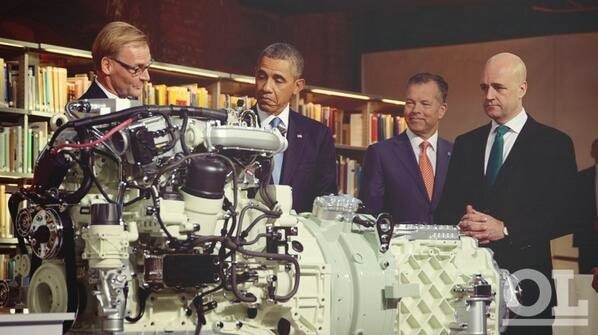 A few months ago, the US President, Barack Obama, visited Sweden. During the two days long visit, the inner core of the capital of Sweden, Stockholm, was sealed off with thick concrete barriers, the Swedish police brought in personnel from around the country, and the Swedish army installed radar stations around the capital. Sweden was actually considered a "high-risk" country mainly because of the murders of Prime Minister Olof Palme in 1986 (still unsolved) and Foreign Minister Anna Lindh in 2003. While not hanging out with royalties and politicians, President Barack Obama decided to visit the Royal Institute of Technology (Sweden's MIT) where he looked at the latest environmental friendly technologies. According to the image below, he was impressed. The guy on the left is Olof Persson - the CEO of Volvo AB (not to be confused with Volvo cars which today is owned by the Chinese and has another CEO). The machine in the middle is an electric hybrid powertrain for buses. With it installed, it will lower the emissions with 80 percent compared with a bus powered by diesel. The engine has already been installed in buses that haul people around the town of Gothenburg. Volvo has also begun a collaboration with California where the aim is to develop a truck powered by electricity. Another project the President showed interest in was Solvatten (Sunwater). According to their website, Solvatten "is a portable 11 liter container that is harnessing sunshine to heat and treat water at household level. Put Solvatten in a sunny place, expose it for 2-6 hours and the water will be drinkable. An indicator shows when it is safe to drink. 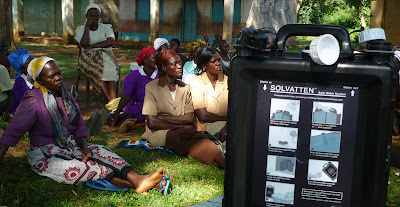 Solvatten can also be used as a solar water heater, providing hot water for cooking and hygiene." 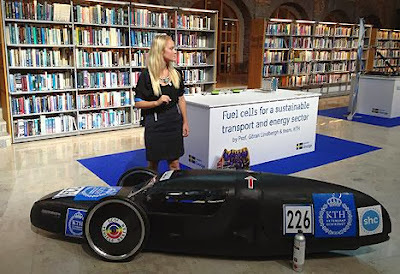 A third project was the fuel cell powered car Sleipner. The car Sleipner can drive 1 500 km on hydrogene gas containing energy equivalent to 1 liter of gasoline. It's obviously not a real car - more of a school project - and has competed in the Shell Eco Marathon where it ended at place 8th of 27 competitors. The President was also shown a fuel cell that uses olive oil production residues to produce electricity, and the mobile charger called PowerTrekk. In the image below, you can see the mobile charger which can charge an iPhone from 25 percent to 100 percent. To charge, you have to add water. The water doesn't have to be super-clean - it can be sea water. But this isn't free energy from water, the black thing in the image below that looks like a hockey puck has to be replaced after each charge. According to their web-shop, you have to pay around 7 USD per "puck," but as the technology improves, the price will be lowered. 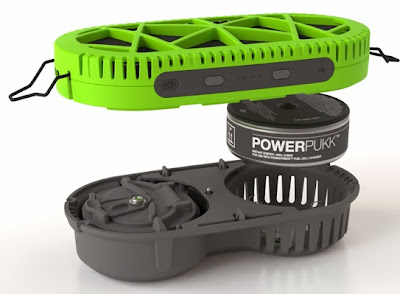 This is not a technology for the average consumer, who can charge the phone at home, PowerTrekk is useful if you travel or live in an area without electricity.